This beautiful Spring day led me to want to go on a nature hike. I have to admit, I love taking my kids on nature hikes. Fresh air, new growth, and simply hanging out with my kids is something wonderful. So with a hike in mind, I was thinking of what to pack to eat. I scanned the kitchen, and noticed this great thin sliced bread that I picked up at my local panaderia (Mexican bakery), some fresh baby arugula, and a couple of other items that would make a really great sandwich. Lay out the bread. Add the cheese spread to all three slices. On the first slice of bread, layer the arugula, tomato, and salami. Top with another slice of bread, spread side up. Do the same by layering the arugula, tomato, and salami. Top with the last slice of bread, spread side down. Cut on the diagonal. 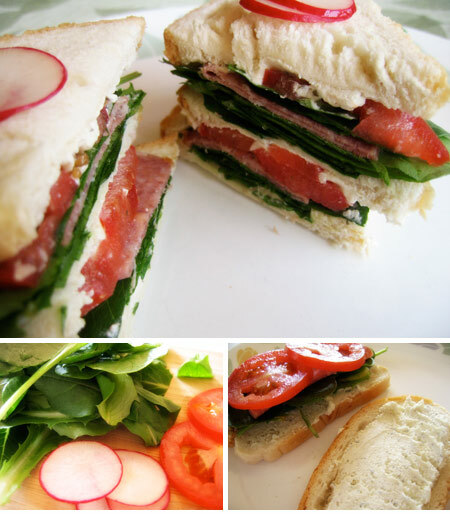 With a toothpick, pick two thinly sliced radishes per pick, and insert into the top of each sandwich. Wrap up and bring out during the perfect time during your hike. Enjoy.